As I’ve previously mentioned in Part I of this series of posts, there are many options for the environmentally-conscious shopper, even when it comes to buying interior doors. I had focused on beautiful, reclaimed wood doors that add instant character and richness to any home. Here, I’ll highlight residential and commercial doors made with recycled content. Humabilt’s high quality, sustainable interior doors, available in a variety of designs, sizes, wood species and glass panels, are composed of 85% waste wheat straw and free of synthetic [urea] formaldehyde. 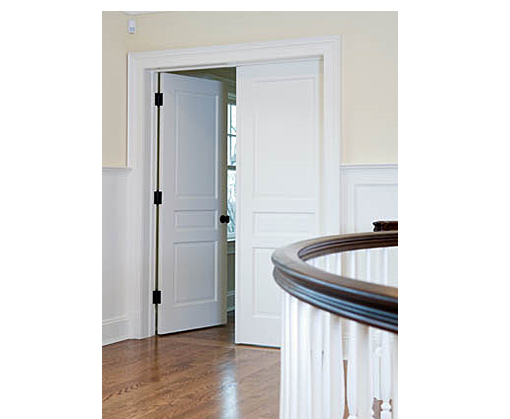 Their wide selection of finely-crafted, yet affordable, styles is available in both paint- and stain-grade doors. The company is located in the quaint, picturesque town of Ashland, Oregon, with a centrally-located manufacturing facility to service the entire United States. TruStile offers an extensive line of MDF doors (pictured here) certified by SCS (Scientific Certification Systems) which contain 82% recycled content and are manufactured with low-emitting adhesives and primers. There’s even an MDF option with no-added formaldehyde. CraftsMaster’s interior doors are SCS-certified to contain recycled content, plus no added urea formaldehyde. Its molded door designs contain a minimum of 25% pre-consumer recycled wood content, the Hollow core Green Doors contain a minimum of 23% recycled content, and solid core Green Doors contain a minimum of 48% recycled content. Jeld-Wen’s molded hollow core slab interior doors are SCS certified to include at least 60 percent recycled content. The facings themselves are made from 80 percent recycled content. The company’s molded bifold doors contain at least 25 percent recycled content. You’re precisely right on this piece.